What family does the Cheetah belong to ? The Cheetah is a feline, like the tiger, the lion or the lynx but his particular characteristics inspired scientists to create a sub-family, or genus, of which he is the only member : Acinonychinae. His scientific name is thus : Acinonyx jubatus. With respect to his name in English, « Cheetah » comes from the Sanskrit word meaning «variegated body ». How should we describe him ? The cheetah is a mammel which resembles a cat, only much larger. He is lanky, and seen head-on, it looks as if he has been flattened, because he is so thin. When looking at his profile, one observes his head at one end of his body appearing almost too small with respect to the rest of his body, and at the other end, his long tail. His thorax, or chest, is as wide as his waist and narrow. The cheetah's large paws afford him a slender but majestic gait, and end in semi-retractable claws, just like with other cat-like species. His magnificant short fur which has caused him some serious troubles (We will come back to this later) is yellowish tan in colour and covered by black spots. He has a unique face with two black lines, which seem almost designed, running from the corners of his eyes down the sides of his nose like two eternal tears. Mister and Missus Cheetah do not weigh the same, the male being heavier and larger than the female. At adulthood, their size varies from 35 to 70 kilos and they range from 1.15 to 1.50 in total body length, not including the tail, which measures an average of 75 cm. How long does the Cheetah live ? Everything depends on the environment in which he is found. In the wild, he will live an average of 12 years but in captivity, he can expect to double his life expectancy to 20 years. Why does he run so quickly ? Everything about him is designed for speed, including his soft bone structure which allows for enormous strides measuring up to 8 metres, his long tail which serves as a rudder for steering when running at full speed, his heart which is able pump great quantities of blood and his large nostrils which allow for increased oxygen intake. Also, the cheetah's large arteries are designed for effective blood circulation, while his powerful paws have a unique ligament structure all allowing him to reach a maximum speed in less than 4 seconds ! At four strides per second, certain subspecies move at a rate of that exceeds 120 kilometres/hour. It is quite simply the fastest land animal in the world ! 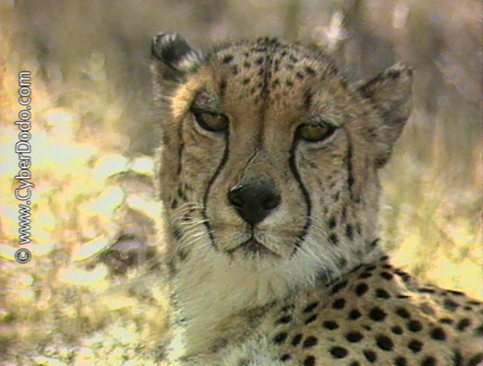 However, this unique capacity has its price to pay, as the Cheetah is not able to keep up this performance for more than a few hundred meters, at which point he must slow down and catch his breath for several minutes. At full speed, his respiratory rate reaches 100 breaths per minute, that is, more than one breath per second. His attacks must therefore be effective and sudden, which is why he does not strike until he is very close to his prey (within a range of a dozen or so meters). It is also interesting to note that the Cheetah is able to successfully conclude half of all his hunts, which is really quite remarkable.